Does your child like Fancy Nancy? My granddaughter loves her. She was so excited to get the Fancy Nancy dress to play dress up in. What I love about this cartoon is that Nancy speaks French and the other day my granddaughter asked for something and followed it up with “S’il vous plaît” which is French for please or if you please. She is actually learning FRENCH! 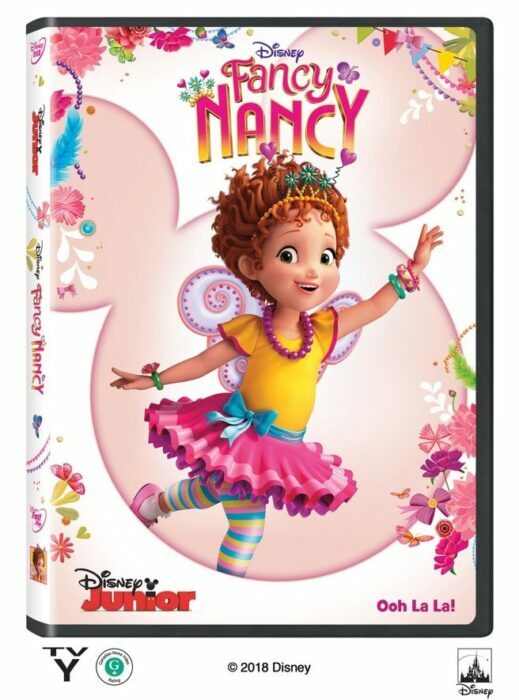 We received a free copy of the Fancy Nancy Volume 1 DVD. My granddaughter will be so excited to get the DVD. The Fancy Nancy shows are adorable and suitable for any age. Every episode has a lesson to be learned, without displaying unwanted behavior. You will not see Nancy whining or throwing a fit. She does not lie. She has every day issues of young children, and learns to handle with them with grace. Bonus in the series is the impromptu French lessons! In every episode, Nancy uses French words, and stops to explain what they mean in English. This DVD will make a fantastic gift or stocking stuffer this Christmas. Release date of the DVD was November 20th. Grab some glitter, add a dash of “ooh la la,” sprinkle in original songs and… Voilà! Get set to pour on the fun with Fancy Nancy. There are six 22-minute Episodes on this dvd!